This glogg recipe is a spiced wine often drank throughout Scandinavia with countries like Sweden, Norway, Denmark and Finland having their own variations. 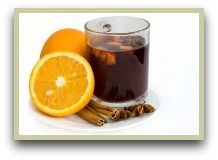 Many countries, particularly Europe, have their own versions of mulled wines traditionally drunk around the holidays. Glühwein is the spiced wine of choice in Germany and Holland. Whilst in the Czech Republic they enjoy svařené víno and the Hungarians drink forralt bor. ...cloves, cinnamon, nutmeg, star anise etc, but usually with a traditional twist. A good example is izvar, the Moldovan mulled wine, which has added honey and black pepper, which sounds intriguing! Combine all the ingredients together and store in an airtight jar out of sunlight. That's it! Super simple. Click for another traditional mulling mix recipe. Now you've made the mix, why not try the traditional wine? Reheat and then you can use a slotted spoon or pour through a strainer to remove the fruit and glogg parcel. I often drink it with the fruit still in.